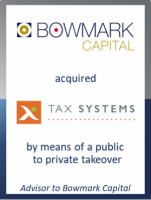 GCA Altium advised Bowmark Capital, the mid-market private equity firm, on their acquisition of Tax Systems Plc, the leading provider of corporation tax software and services in the UK and Ireland. The transaction valued Tax Systems at £114 million. Founded in 1991, Tax Systems’ portfolio of solutions automates the end-to-end tax compliance process enabling the company’s clients to: increase the accuracy of their tax reporting; reduce the risk of non-compliance; and free up the tax function to focus on value-adding tasks. Clients include a large proportion of the FTSE 250 and 23 out of the top 25 accounting firms. Bowmark effected the acquisition through a scheme of arrangement under the UK Companies Act and is investing alongside the current management team to support the company’s continued expansion. The Bowmark investment will also enable the company to accelerate the development of new products and services, particularly in response to the roll-out of HMRC's new "Making Tax Digital" initiative, which aims to modernise the way tax is reported. Bowmark managing partner Charles Ind said: “We have been tracking the company for a number of years and are delighted to be supporting Gavin Lyons and his team. Tax Systems has an enviable position as a trusted partner to the majority of the UK’s largest corporates and accounting firms. We look forward to supporting the team as they capitalise on the opportunities arising from the digitalisation of tax compliance.